Skinner Presents Auction of Historic Arms & Militaria, October 27 | Skinner Inc.
MARLBOROUGH, MA – Skinner, Inc. will hold an auction of Historic Arms & Militaria on Thursday, October 27, at 10AM. The auction features over 300 lots of important militaria from the American Revolution through World War II, including artillery, swords, pistols, powder horns, uniforms, muskets, and rifles, highlighted by The Dr. James Woodward Wallace Collection of Fine Sporting Arms. 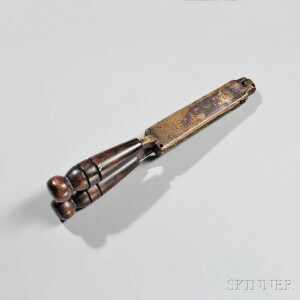 Joel Bohy, Director of Historic Arms and Militaria, notes that Skinner’s October auction is a time capsule of materials in this collecting category. Lots range from an early medieval throwing axe, cannons, and iron armor to World War II airborne uniforms and a wide variety of late 20th century firearms. One outstanding offering is Lot 325 (Estimated between $8,000-10,000), a pair of artillery calipers that represent a rare and critical aspect of American artillery history. Primarily used to determine the caliber of cannon, these specialized instruments are not common. This example is extremely rare because it is made of boxwood, not the more usual brass, and was made in America before the Revolutionary War. The craftsman, Anthony Lamb, is the earliest documented mathematical and scientific instrument maker known to have worked in the colonies. The calipers are marked with his name as well as scales and calculations for charges for various weapons. 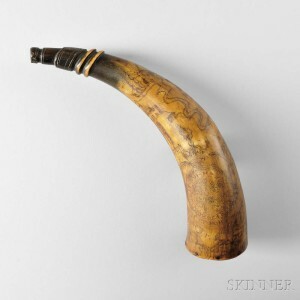 Powder horns are much sought-after for their historical associations and their often lively pictorial decoration. Two distinguished lots in this auction date from the French and Indian Wars of the mid-18th century. Lot 323 ($2,500-3,500) displays the lion and unicorn of the British coat of arms, foliate designs, cannon, flags, and a fort, and has a plug with the carved initials of the owner, Caleb Butters. Lot 324 ($4,000-6,000), the New York Map Horn, is elaborately decorated with the royal coat of arms above two cannons, flags, arms, stacked cannonballs, two dogs chasing a buck, a map including the upstate New York town of Oswego, and a couple of sailing ships. Lot 328 ($5,000-7,000) is comprised of a belt plate and cartridge pouch dated between 1771 and 1776. Such items were made in great numbers and many have survived. But these, say Joel Bohy, are unique. There is impeccable documentation referring to this equipment, issued to the British 7th Regiment of Foot. A surviving invoice shows that 200 sets of old accoutrements were repaired and updated followed shortly by alterations to one hundred more. Although the equipment is known to have been issued, this lot includes the only surviving examples from this regiment between 1771 and 1776. Uniforms from the Revolutionary and Civil Wars continue to be prominently featured in auctions of arms and militaria. They are now being joined by mementoes of more recent conflicts. This auction includes ten lots of World War II airborne uniforms. Joel Bohy remarks that interest in the soldiers who formed the parachute infantry, as they were formally known, was stimulated by the 1993 book “Band of Brothers” by Stephen Ambrose and the related 2001 television series. Lot 363 ($400-600) is comprised of the Eisenhower jacket, cap, trousers, and shirts owned by Captain S. Scrivener, 101st Airborne Division, who participated in the Normandy invasion among other operations. The sale concludes with a large assortment of firearms, including military rifles and pistols from many World War II combatant countries. Auction previews are free and open to the public. Previews will be held in Marlborough on Tuesday, October 25 from 12PM – 5PM and on Wednesday, October 28 from 12PM – 7PM. Illustrated catalogs for auction 2946M are available from the Subscriptions Department at subscriptions@skinnerinc.com or from the Gallery. Prices realized will be available online at www.skinnerinc.com during and after the sale. 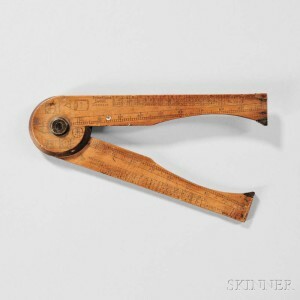 The Skinner website also enables users to view all lots in the auction, leave bids, order catalogs and bid live, in real-time through SkinnerLive! Skinner reminds bidder that Lots 68-225 and 404-563 require a Federal Firearms License and are not available for online bidding. Interested bidders should contact William Madden at 508-970-3266 for further information. This entry was posted in News and tagged 20th century firearms, Anthony Lamb, artillery, artillery calipers, British 7th Regiment of Foot, Caleb Butters, cannons, early medieval throwing axe, historic arms, historic militaria, iron armor, marlborough, muskets, pistols, powder horn, powder horns, rare militaria, rifles, skinner, skinner auctions, swords, uniforms, World War II airborne uniforms by Skinner. Bookmark the permalink.